Jianyang (Northern Min: Gṳ̿ing-iô̤ng-dī / 建陽事) is a dialect of Northern Min Chinese spoken in Jianyang in the north of Fujian province. Jianyang dialect has 18 initials, 34 rimes and 8 tones. The entering tones in Jianyang dialect don't have any entering tone coda (入聲韻尾) such as /-ʔ/, /-p̚/, /-t̚/ and /-k̚/. It's quite different from many other Chinese dialects. ^ Hammarström, Harald; Forkel, Robert; Haspelmath, Martin, eds. (2017). "Jianyang". Glottolog 3.0. Jena, Germany: Max Planck Institute for the Science of Human History. Chen, Matthew (2000). Tone Sandhi: Patterns across Chinese Dialects. CUP. Norman, Jerry (1969). 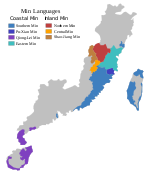 "The Kienyang Dialect of Fukien". Ph.D. dissertation, University of California, Berkeley. Compilation Commission of Chorography of Jianyang County 建阳县地方志编纂委员会 (1994). Jian yang xian zhi 建阳县志 ["Chorography of Jianyang County"]. 31. Beijing: Qunzhong chubanshe 群众出版社 ["Masses Press"]. ISBN 9787501412297. This page was last edited on 17 May 2018, at 10:31 (UTC).